HCM CITY— HCM City plans to spend more than VNĐ5.7 trillion (US$253.7 million) on three general hospitals in the city’s outlying districts, according to the Department of Health. The construction of the three hospitals, which will help reduce 80 per cent to 90 per cent of patient overloads at city or central-level hospitals, is expected to start in first two quarters of next year. The hospitals will be built with many specialised wards and modern medical equipment. The doctors and nurses as well as other health staff who will work at the new hospitals have improved their qualifications to gain the trust of local residents and those who live in their neighbouring areas. The hospitals are the city’s main projects of the Ministry of Health’s programme to reduce patient overcrowding. Ground clearance and compensation for building the new Hóc Môn General Hospital was completed in February, 2015. The 15-hectare Hóc Môn General Hospital, 13.7-ha Củ Chi General Hospital, and the 16.7-ha Thủ Đức Hospital will have 1,000 beds each. It is expected Prime Minister Nguyễn Xuân Phúc will approve the three projects this month and then the committee will choose the contractor and carry out the next steps of the construction. The projects will be divided into two phases of construction. Củ Chi District People’s Committee has committed to finish compensation for residents affected by the construction and hand it over to the Department of Health’s management board of construction works in the last quarter of this year. 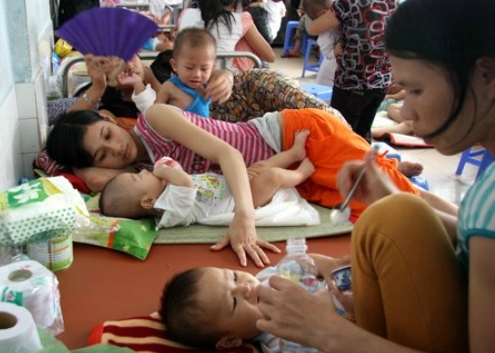 Moreover, the department plans to upgrade other district-level hospitals, such as Bình Chánh and Gò Vấp. Work on the second branch of an Oncology Hospital covering around 5.6 hectare in District 9 started in late June to reduce the existing overload of patients at the first branch in Bình Thạnh District. Another paediatrics hospital named City Paediatrics Hospital with 1,000 beds is under construction and will be put into operation this year in addition to the two paediatrics hospitals. The city has the highest ratio in the country of beds at 42 per 10,000 residents, but it still has faced overloading. Dr Tăng Chí Thượng, the department’s deputy head, recently told Việt Nam News that unlike other countries, patients in Việt Nam often go straight to city or central-level hospitals for their health examinations and treatment. Whereas, only 4 per cent to 6 per cent of patients come to grassroots-level health facilities, Thượng said.